Welcome to A10 Talk’s Top 14 Coach Countdown of the 2016-17 season. We like to rank the players of the A-10 each season, but we’d also like to take a look at the brains of the operations. Who were the best coaches of the 2016-17 season? Who were the worst? Our site voted and compiled a list based on last season alone. This list is representative of how well each coach performed in the 2016-17 season, not in his entire career. Today, we feature #8 Bob McKillop. Honestly, Bob McKillop didn’t do a whole lot in order to get this win; at least it may seem that way on the surface. But in reality, the veteran head coach did exactly what he needed to do in order to help his team win: let his best player do his thing. Jack Gibbs took over the end of the A-10 Quarterfinal game against Dayton, and the Wildcats’ victory didn’t require any elaborate plays or schemes. Davidson played its game, knocked down its three pointers, and when it mattered most, senior Jack Gibbs hit his shots to send Dayton packing. Can a coach’s best moment really come during a loss? Certainly. Look at Davidson’s non-conference games against North Carolina and Kansas, and you’ll see how that can be the case. To put it lightly, Davidson put up one heck of a fight against 2 eventual 1 seeds in the NCAA Tournament. Particularly against North Carolina, Bob McKillop’s gameplan worked to perfection; he wanted to double the post and take away easy buckets inside. The Tar Heels had a difficult time getting Kennedy Meeks and Isaiah Hicks touches, but Justin Jackson absolutely scorched Davidson from downtown. Davidson was in this game until the end, and you can’t ask for much more if you’re the Wildcats. 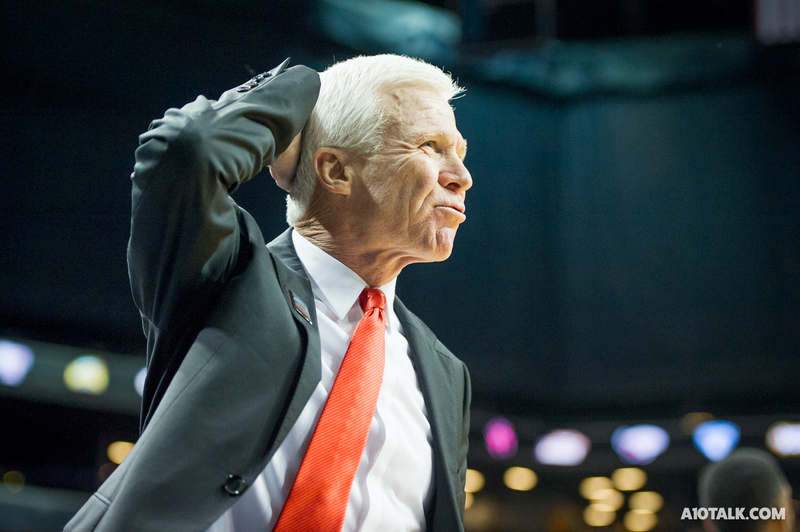 Bob McKillop coached his heart out in both games, though his team came up short. Bob McKillop had some great moments, particularly at the beginning and end of the season, but he also had some big letdowns. Davidson crumbled and was held nearly scoreless in the final 5 minutes at home against Fordham. The Wildcats had no answer against a pesky Fordham team, and coming away with a loss in this one all but buried any NCAA Tournament hopes Davidson might have had. Blowing second half leagues was an issue all season, particularly against the better teams in the league. Davidson fell apart late against Rhode Island twice and Dayton once. Had the Wildcats been able to hang on and lock down on defense in the final 10 minutes, they would’ve come away with some really big wins in the regular season. It’s not necessarily the loss itself that hurts, but it’s the way Bob McKillop’s team went down. Allowing the Explorers to put up 91 points in 40 minutes, the Wildcats’ defense may as well have been non-existent. This has been an issue for Bob McKillop teams in the past, and we see that problem rear its ugly head yet again. Even when Davidson is firing on all cylinders and hitting its threes, it gets outmatched down low, doesn’t do a good job cutting off lanes, and shooters get wide open looks. Davidson fixed that problem nicely when it faced La Salle at the end of the season, but this has always been an issue for Bob McKillop. There was high hope for Davidson this past season, and the Wildcats fell somewhat flat. Next year could be a different story. Peyton Aldridge is set to be a potential A-10 Player of the Year, and this senior class is loaded with talent. Add 4 star point guard Kellen Grady into the mix, and you’ve got a team that should be close in talent to last year’s squad. Davidson will need to close games and pull out some big conference wins if it wants to go dancing.